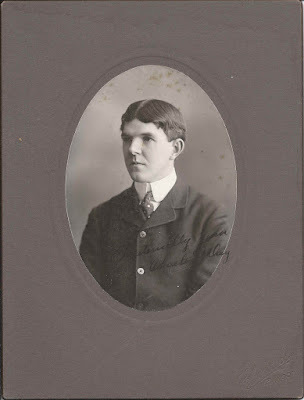 c 1904 photograph of Charles Iven Day of Newcastle, Maine, taken by the Chalmers studio at Bangor, Maine, while Charles was a student in the engineering department at the University of Maine at Orono and a member of the Alpha Tau Omega fraternity. I saw an online reference where he was described as a Columbia-trained engineer, so it appears he pursued postgraduate training in engineering. Charles Iven Day was born 23 January 1882 at Newcastle, Maine, son of George Oliver Day and Charlotte (Hodgkins) Day of Newcastle, Maine. At some point before 1910, Charles married Isabelle Merry Chapman, daughter of Omar Edwin Chapman and Alda Asenath (Barstow) Chapman. An announcement of their engagement was in the 6 March 1907 issue of the Cornell Alumni News. "Belle" was born 30 August 1882. In the 1910 Census, Charles and Belle were living at Palm Beach, Florida, where Charles was working in the hotel business, although I found a reference online to his service in the US Revenue Cutter Service in Florida, as well as earlier in New York. The 1920-1940 Censuses found them living at Troy, New York, where Charles managed a scientific company. He's listed as president of the W. & L. E. Gurley Company at Troy, in a 1935 government publication. Charles and Belle had a son Lawrence Chapman Day, who was born at Newcastle, Maine, in 1912. A reader adds that there was a daughter Jane E. Day who married a Mr. Miller. If you have corrections to the information above or stories to share on the Day and Chapman families, please leave a comment or contact me directly. Thanks! Lawrence Chapman Day died Mar. 1977, Lincoln Co., Maine. Buried in the Hillside-Norris Cemetery, Damariscotta, Me. He had a sister, Jane E. Day, who married a Miller. She died 1989, buried in same cemetery. I am a 3 cousin 1 time removed from his mother, Isabelle Merry Chapman. Thanks for taking the time to add this additional information about Jane. Much appreciated.